Dois dias após os acontecimentos, um conflito envolvendo policiais e trabalhadores provocou a morte de alguns manifestantes. Este fato gerou revolta nos trabalhadores. Provocando outros enfrentamentos com policiais. No dia 4 de maio, num conflito de rua, manifestantes atiraram uma bomba nos policiais, provocando a morte de sete deles. Foi o estopim para que os policiais começassem a atirar no grupo de manifestantes. O resultado foi a morte de doze protestantes e dezenas de pessoas feridas. Foram dias marcantes na história da luta dos trabalhadores por melhores condições de trabalho. Para homenagear aqueles que morreram nos conflitos, a Segunda Internacional Socialista, ocorrida na capital francesa em 20 de junho de 1889. Criou o Dia Internacional dos Trabalhadores, que seria comemorado em 1º de maio de cada ano. 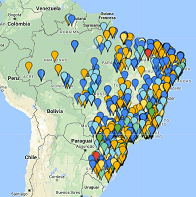 Aqui no Brasil existem relatos de que a data é comemorada desde o ano de 1895. Porém, foi somente em 26 de setembro de 1924 que esta data se tornou oficial, após a criação do decreto nº 4.859 do então presidente Arthur da Silva Bernardes. Neste decreto. Arthur Bernardes estabeleceu a data como feriado nacional, que deveria ser destinado à comemoração dos mártires do trabalho e confraternização das classes operárias. Labor Day, also known as Labor Day, is celebrated on May 1. In Brazil and in several countries of the world it is a national holiday, dedicated to celebrations, demonstrations, rallies, exhibitions and events of protest and awareness. The History of Labor Day dates back to 1886 in the industrialized city of Chicago (United States). On May 1 of this year, thousands of workers went to the streets to demand better working conditions, among them, the reduction of the workday from thirteen to eight hours a day. On the same day a major general workers’ strike occurred in the United States. Two days after the events, a riot involving police and workers led to the death of some demonstrators. This fact generated an uprising among the workers. Causing other clashes with police officers. On May 4, in a street clash, demonstrators threw a bomb at the police officers, killing seven of them. It was the trigger for the police to start firing on the group of demonstrators. The result was the death of twelve Protestants and dozens of wounded people. These were remarkable days in the history of the workers’ struggle for better working conditions. To honor those who died in the conflicts, the Second Socialist International, held in the French capital on June 20, 1889. Created the International Workers Day, which would be celebrated on May 1 of each year. Here in Brazil there are reports that the date is celebrated since the year 1895. However, it was only on September 26, 1924 that this date became official, after the creation of decree nº 4.859 of the then president Arthur da Silva Bernardes. In this decree. Arthur Bernardes established the date as a national holiday, which should be destined to commemorate the martyrs of labor and fraternization of the working classes. However, in the 1930s and 1940s, President Getúlio Vargas started using the date to publicize the creation of laws and labor benefits. The character of protest of the date was left aside, happening to assume a bias commemorative. Vargas went on to call the date “Labor Day”. – On May 1, 1940, President Getúlio Vargas instituted the minimum wage. This should meet the basic needs of a family (housing, food, health, clothing, education and leisure). – On May 1, 1941, the Labor Court was created to resolve legal issues related specifically to labor relations and workers’ rights. In recent years the expression “Labor Day” or “Labor Day” has become widely used in reference to the commemorative date of May 1st. Many people consider this second option to be more appropriate, since it refers to the worker (who deserves the commemoration). For these people, calling the date “Labor Day” is not the most appropriate, because it emphasizes work (the act of creating and producing goods and services in return for remuneration). However, in Brazil today, the two options are still widely used.